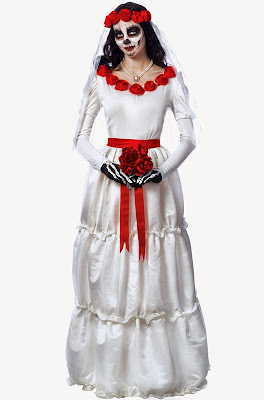 This Day of the Dead Bride costume is quite striking, with its red accents over gleaming white. It comes with the gown, the veil, the skeleton gloves, and even the red faux rose bouquet! Her partner, the Day of the Dead Groom, wears matching red accents. 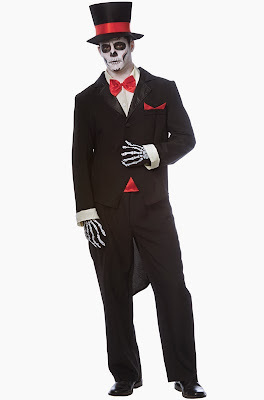 His "tuxedo" costume includes the tuxedo jacket, the pants, dickie collar, bow tie, skeleton gloves, and hat. To make the groom costume even scarier, add this Day of the Dead mask!